I recently spoke with a man who met Robert Kennedy. There can’t be too many of them left about the place. It was years ago now, back in the sixties, I think, when he was in Washington DC on some kind of GAA junket, probably to promote the sport, to remind the Diaspora in the States of what it had left behind it back on the Emerald Isle. 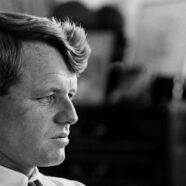 Robert Kennedy was his brother Jack’s Attorney General, the chief lawyer in the country, the legal adviser to the president, the representative of the law. I thought of politics back then and how it must have seemed that the country was being remade what with Civil Rights and the Cold War, the Red Scare, McCarthyism, the era of Free Love and the rise of the Teenager with a capital T. This was the eve of the Vietnam War and the exportation of at least 58,000 American lives, young men for the most part who never grew to be old men. I thought of that word “veteran” and reflected that my interlocutor was in his way, in his own ways, a veteran too, like we all are. We grow into that identity, fill the long cloak of that stature the more we live, the greater the repertoire we amass. Story after story gets told and experiences come and go; we encounter others and their lives and compare them with our own and probably never fully appreciate the full story, the complicated richness of existence. Then the silence. When, upon the next scandal or concern or affair of state, we think we see a pattern, something to decry over a pint or in a breathless fashion between two daily chores, we arrogate to ourselves a wisdom, the illusion of which helps us conceive of ourselves in such a way as to reassure us that we are progressing through time toward an end point, one we realise we’ll never reach; rather, the reaching itself is what regulates us, the striving toward the best version of ourselves. More and more of the good and bad is stacked up in our individual and collective memory and nation-building progresses in fits and starts. To be Irish is to be many things but there are, we believe, certainties on which we can depend though as soon as I try to list a few I draw a blank. Never in the history of the world have there been so many words, all of which in one way or another represent ideas. What a literate world we inhabit; some argue that there is too much truth-telling, so much that we can’t possibly keep up. Can we pick just a few and latch on to them as a safer means of progressing? What might those truths be? The teleological argument is that there is a designer or at least a sense of design behind everything. The system works because one part of it serves another. Others argue for accident: evolution happens this way, we’re told. Natural selection dictates that those who are lucky enough to be born with certain attributes will live longer and better and therefore are more likely to distribute their genes. These genes in turn, because of their wide distribution and proven success, become, if not the norm then the ideal. We wonder how lucky we’ve been; what natural endowments can we parade, with suitable modesty of course and obtrusive self-deprecation. Genuine doubt is the cornerstone of progress perhaps. William Blake wrote, “Without contradiction is no progression.” Why does anyone have to have any particular opinion? Shouldn’t we approach every interaction, every conceivable experience from the standpoint that experience has taught us how little we do know? Circumspection – to go round something whilst looking at it – implies skepticism and dispassion but why is that valuable? Marcus Aurelius advised thus: “Be simple; reserve judgement.” He, it would appear, might have had things to share with Blake. RFK, had he lived longer, might have become President. As it is he is now a martyr to some, a deluded liberal to others, to still more he was an astute but selfish political animal, ambitious and ruthless. But, as Yeats might say, he too has played his part in the casual comedy and has left the stage. Then the silence. How, Prufrock asked, am I to presume?